This took me few minutes to figure out and was quite annoying. First you must add a reference to System.Windows.Forms in your application. Go to Project -> Add reference, select System.Windows.Forms from .NET tab in the window that just opened. You must avoid the ThreadStateException by applying the STAThread attribute to your Main() function. Then you can use the Clipboard functions without any problems. The External API allows an ActionScript developer to easily interact with the container program that is hosting Flash Player 8 and vice versa. The majority of the time, this will most likely be a Web browser, but this does not always have to be the case. As many C# developers know, it is easy to house an ActiveX control (the IE version of Flash Player) in a .NET Windows application. This means we can now load an SWF in our Windows application and easily send data back and forth. Keep in mind that the keyword in this statement is "easily;" although possible before, it was not nearly as simple as the External API makes it now! Basically, the code above will allow us to call the addText function (which I will show in a minute) from the C# application. As you can see, I am calling a method sendText and passing the input string as a parameter. 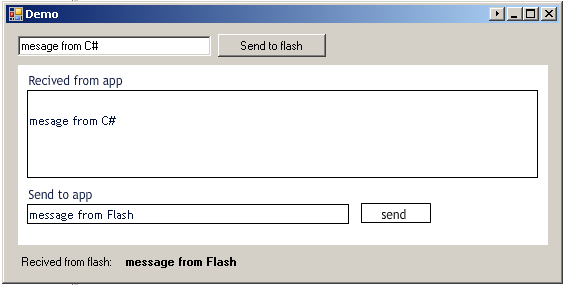 Now to receive the message in C#, we first have to subscribe to the FlashCall event. You can do this in the constructor or from the activex properties panel on events tab. I have made the simple example discussed available here.